1 2/3 ounce semisweet chocolate (reduce sugar in recipe by 2 teaspoons) OR 3 tablespoons unsweetened cocoa plus 1 tablespoon butter, margarine or shortening can be used instead of 1 ounce unsweetened baking chocolate or 1 ounce premelted unsweetened chocolate. 1 cup dark corn syrup can be substituted for 1 cup light corn syrup, and vice versa. (Note: Flavor will be affected somewhat.) OR substitute 1 1/4 cups sugar plus 1/3 cups liquid. 1/2 tablespoon cornstarch, potato starch, rice starch, arrowroot starch, or 1 tablespoon quick-cooking tapioca can be substituted for 1 tablespoon all-purpose flour. 1 1/4 cups sugar plus 1/3 cup liquid (use whatever liquid is called for in the recipe) can be substituted for 1 cup honey. You can't substitute meringue powder for egg whites in most recipes because it contains other ingredients such as sugar. 1 cup honey can be substituted for 1 cup molasses. (and vice versa) Note: flavor will be affected. 1 cup melted butter, margarine or shortening can be substituted for 1 cup oil. Note: Recipe results may vary. Texture and appearance may be affected. 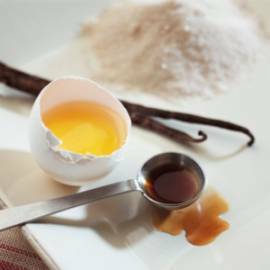 If you run out of vanilla extract or flavoring, you can substitute maple syrup, teaspoon for teaspoon. I have done this and I absolutely can't tell the difference. Milk is one of the easiest ingredients to substitute in baking. Non-dairy milks and water are suitable replacements with only subtle effects on taste and texture. Some ingredients may affect the coloration of the finished product. Soy will often cause a darker color or browning effect. Another consideration is that not all liquid replacements are as thick as milk; therefore, the amount used may need to be reduced from the amount called for in the recipe.